Space Millions are a husband-ish and wife-ish iOS design and development team. We also do other stuff. We make apps that get people together. Our first is called FOURSCORE. We have another one that will be out pretty soon. FOURSCORE is our first iPhone application. We learned a lot and did our very best. 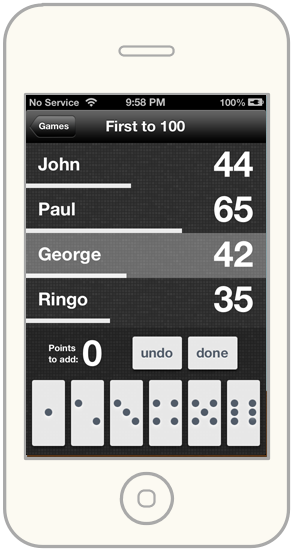 It's an app that helps you keep score for games that you play with your friends. Whether its dominoes, Scrabble, cribbage, rummy, board games, dice games, or any competitive game between friends that you want to keep track of, FOURSCORE keeps it clean and beautiful.